As it's Christmas, what better to celebrate the festivities by looking at a game where the main character looks like Jesus? Albeit with rather large sword in hand rather than that bread he made once. 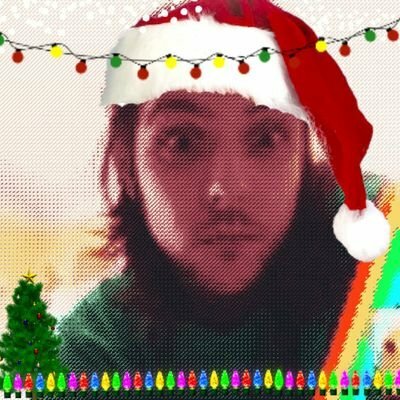 Not only is the Jesus reference valid, but also what better way to relate to Christmas than with a bit of violence? There's always a war film on at Christmas, a Bond film or failing that, there's always a bit of a scuffle with family members after one too many sherries. Or is that just my house? Of course, if you remember when the game was released (I was far too young!) there was a lot of controversy regarding the front cover. Banned in some countries, it featured a young-ish Wolf from the TV series 'Gladiators' (that's not why it was banned) and a scantily clad (nice 80's term) Maria Whittaker (also a nice 80's term). There was outrage there was so much flesh on show, but didn't they know this is how all women dressed back then? (I mean in the age of the Barbarian, rather than the 80's) I'm just thankful Wolf isn't in his leotard. Enough talk of controversy and leotards, let's get on with the game, shall we? 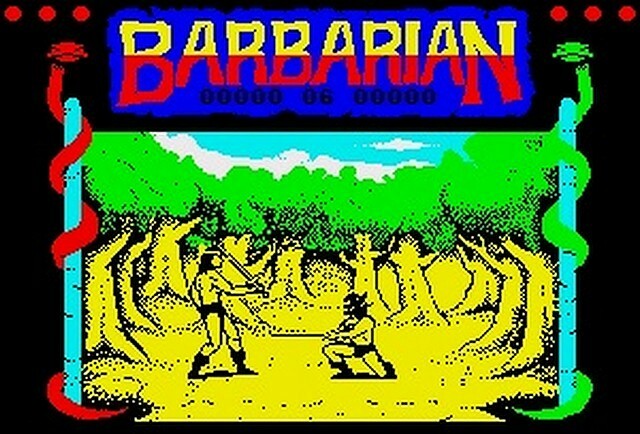 Barbarian is a one-on-one fighter whereby you have to take down your opponent using a variety of moves, of which the majority involve your sword. You can spin it around and wait for someone to walk into it, an over-the-head chop is also available along with a side swipe. Outside of using your sword, you can headbutt and kick your opponent too, if you can get close enough to them. Take him down, and you're on to the next one - who looks similarly like the previous opponent *ahem*. You do get a background change to liven things up a bit - these can vary from woodland, a gladiator/barbarian pit and others where you'll have onlookers trying to put you off. Just going to spin my sword around over here- if you walk into it, it's your own fault! Your energy is shown in the form of three circles above your allocated snake - yours is purple, the opponent's is green. Get enough hits in to reduce to circles down to zero and you have slain your opponent! Upon this happening a weird little gremlin creature appears and proceeds to drag the fallen body across the bottom of the screen - nice! A nice little touch with regards the energy aspect, every hit sustained will cause the associated snake of the fighter to turn and hiss. Of course, anyone who has played the game before, will undoubtedly be waiting for me to mention the undisputed highlight of the game. We've mentioned Wolf already so no, it's not him - it's not even Maria Whittaker (what??). Enough teasing, it's the spinning-head-chop™ of course! If you've read my previous article on Renegade (which you can read here if you wish! ), you'll see I have a somewhat obsessive adoration for the reverse-kick-to-the-groin™ move. Whereas all reverse-kicks-to-the-groin™ are something to be treasured, the spinning-head-chop™ gives you just that little extra bit of satisfaction. Wolf and Mara Whittaker in Speccy form. Woof woof! Why? You may ask. How can you top the reverse-kick-to-the-groin™? Well, it's a lot more difficult to pull off for a start. Timing is everything and even when the timing is right, you can sometimes come a cropper as you can still get a poke in the eye from your opponent to stop you dead in your tracks. Grrr! It's also a question of distance as you can spin with your sword spinning majestically above your head, and swing it towards that pulsating neck and your just that tiny bit too close. Grrr again! But, when you get it right......ohhh yes! The addition of the gremlin-type-thing™ only adds to the absolute beauty and awesomeness of the whole thing (and you get to see him kick the severed head across the ground as he goes - epic!). Calm down, mate. Don't lose your........oh. 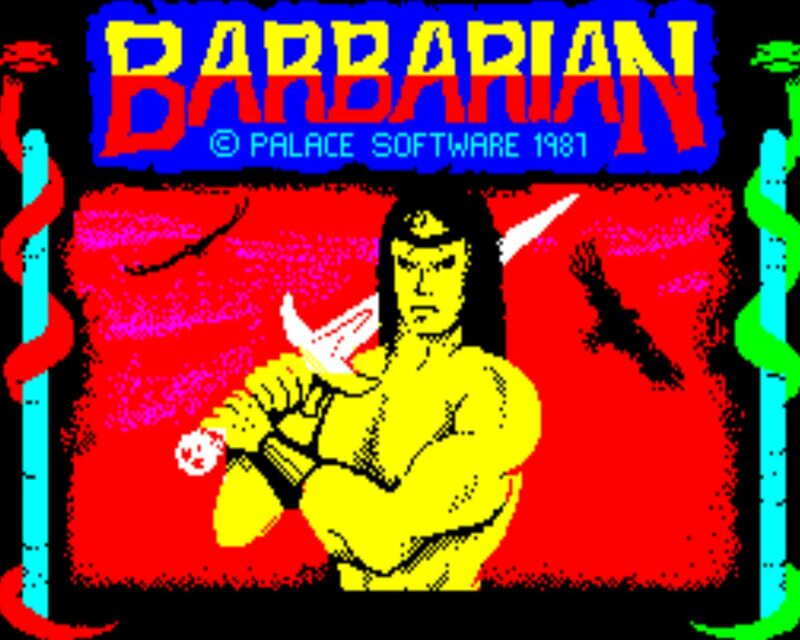 Barbarian is a lot of fun, made better by the fact that there is a two player option so there'll always be a competition to see who can be the first to lop the other's head off. This was the main goal whenever my brother and I fought each other back in the day. Obviously, I won the majority of those competitions (honest). The one player game is also one to be enjoyed. A nice array of moves are at your disposal and it's a good looking game with some pretty smooth animation. You get a nice feeling of achievement when your opponent goes down after a long battle, mainly due to the often tough computer player so you really do have to work hard. Unless of course, you manage to pull off the spinning-head-chop™ where you'll be declared the winner instantly. For obvious reasons. 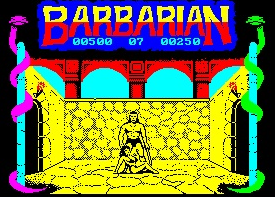 Barbarian deserves, for me, to be one of the Speccy greats for being one of the good fighters for the Speccy. The smooth graphics, the catchy theme tune (it will get stuck in your head!) and of course the spinning-head-chop™, but it's an overall accomplished game that will keep you playing. And, you never know, maybe one day you'll be good enough to fight your way to the end and win Maria Whittakers' heart. Awww....isn't that a lovely thought? This is my best photo - don't laugh! As it's that time of the year, I would just like to say thanks to all the visitors to the site and thank you for reading my ramblings! It's much appreciated! There's more to come next year and I hope you'll join me in continuing to read and enjoying what I write. Please feel free to follow me on Twitter @florinthedwarf and without sounding too Disney - may I wish you a very merry Christmas and a happy new year to you and all your families. Ho Ho Ho!